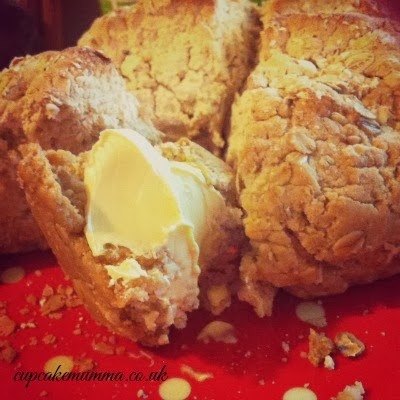 I got my recipe for this gluten free soda bread from here, the Doves Farm website which is packed full of useful free from recipes I can't wait to try. I didn't need to substitute anything for this recipe which is why I won't be publishing it on my blog. I did use some gluten free oats I had in the cupboard to roll my dough on before placing in the oven (this added something extra to my loaf) and also this is a white bread, the recipe I have linked to is a brown bread- but that's all! I found this really easy to make, really quick to make too which is handy. Unfortunately, due to both children deciding to play up at the same time, my loaf was left in the oven a bit too much longer than necessary and was a bit harder than I would've liked! All in all, the method works, the ingredients work and I had a nice supper of a couple of slices smothered in dairy free butter. Yum! I'm linking this up with Jenny and Helen for our Great Bloggers bake Off. For this recipe, Tesco very kindly sent me some gluten free strong white bread flour. Very handy- thanks Tesco! look at all that butter - yum! Fresh bread needs to be covered in butter in my opinion...just delicious!